Flooring Nailers: Pneumatic or Manual? Today most craftspeople install wood flooring with flooring nailers—either manual or pneumatic models. Flooring nailers drive the fastener at the correct angle through the flooring and into the subflooring. The nose of the nailer hooks on the top inside corner of the board’s tongue, and striking the pad on top of the nailer with the rubber face of a flooring mallet drives the fastener home. Some craftspeople prefer manual flooring nailers to pneumatic ones. Manual nailers have fewer parts to break and are not attached to a cumbersome air hose, though they’re limited to driving nails, not staples. Pneumatic nailers cost more initially, unless you already own the compressor. But they aren’t as tiring to use, installation of the flooring tends to be more even, and models are available to fire either nails or staples. I almost switched to manual nailers several years ago because of the poor quality of the first pneumatic staplers I purchased. Over the years, I ended up buying seven of these staplers in order to keep just a few working. 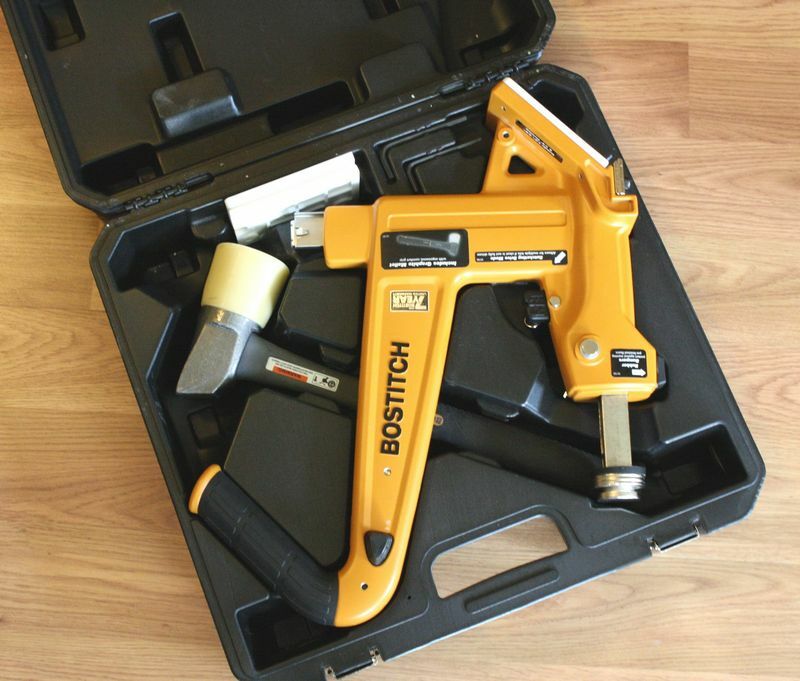 I have since switched to Primatech pneumatic nailers and have had no problems. Here’s another reason I prefer pneumatic nailers. All the force needed to drive the fastener on a manual tool comes from the installer. As the installer gets tired over the course of a day, he or she uses less force resulting in the boards not driven as tightly together. The floor becomes less tight and “grows.” And no two installers will fasten the floor with the same force (which is why when two installers are working together, it’s a good idea for them to switch positions occasionally to even the floor). By contrast, pneumatic nailers allow pressurized air to drive a cylinder and perform most of the work, which means it’s easier to maintain a uniform floor throughout the day. You do have to make sure to maintain the correct air pressure, generally between 70 psi and 90 psi. Too much air pressure will damage the tongues of the wood flooring when using some nailers.